Now we don't have to be told that the Samsung Galaxy S II is already at stratospheric levels as far as Android handsets go, but for those who are not aware, Samsung decided to literally send the gizmo 20 miles high on July 15th, just to prove a point. 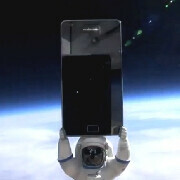 The Samsung Galaxy S II will be tied to a space balloon and sent to the stratosphere as part of the promotional festivities for the handset in Japan, proving once again that Samsung is all-out marketing its finest example of cell phone making. Our own editor Basil Kronfli was literally hanging off a cliff while trying to unbox the dual-core goodness as part of an Extreme Unboxing event in the Snowdonia mountain range in Wales, so we know extreme marketing when we see it. This, however, takes the Galaxy S II promotion to a whole new level, many miles above ground, and it will be broadcasted live on Ustream, plus it will be showing tweets and messages live. Google tried something similar with the Nexus S, excusing itself it was for scientific purposes instead of pure unaltered fun, so we might be having some pictures from the Galaxy S II, while floating 20 miles above ground next month as well. me too. thought it was an official announcement of the attain, function, and within. God what awful names. There better be some multitasking going on here. My upgrade is coming up and it's going to be the LG Thrill (HTC Holidy maybe) or the SGS 2.
get the thrill... it is nice... and didnt the iphone just do this... really samsung? Ha, I love how space is getting this phone before the US. hey, maybe it'll LAND in the US! It'll LAND here when it's been tested in the less important countries. Since it will obviously sell more here. @pandamaja - Yeah that's kind of insulting. This proves there are really aliens in the space and this is Samsung's strategy to advertise their device to them.. lol. f**k that give me the phone!